Theosophy refers to a system of esoteric philosophy seeking a mystical and direct understanding of nature. The Theosophical Society was founded in the late 19th Century and for the most part lost relevance after one of its World Teachers, namely Jiddu Krishnamurti, publicly dissolved the major worldwide organization created by the Society. As with most institutions, the Theosophical Society also suffered from factional strife and philosophical differences. 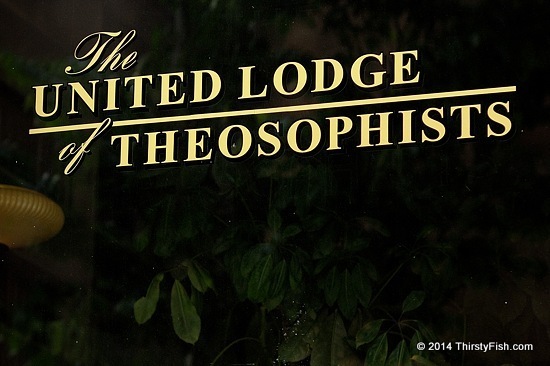 It was surprising to me that a lodge still exists in Philadelphia: The United Lodge of Theosophists. Throughout life, from childhood, from school until we die, we are taught to compare ourselves with another; yet when I compare myself with another I am destroying myself. Instead of old spiritual distinctions you have new spiritual distinctions, instead of old worships you have new worships. You are all depending for your spirituality on someone else, for your happiness on someone else, for your enlightenment on someone else. Knowing the cause of something is not going to help you to be free of it. A solitary ascetic is a symbol of the most cowardly egotism; a hermit who flees from his brothers instead of helping them to carry the burden of life, to work for others, and to put their shoulders to the wheel of social life, is a coward who hides himself when the battle is on, and goes to sleep drunk on an opiate. Theosophy is who Theosophy does, not thinks, not studies, not feels but does.